ISP currently produces custom washers for a filtration company. Washers are made of many different materials, and range in sizes for thickness and dimensions. 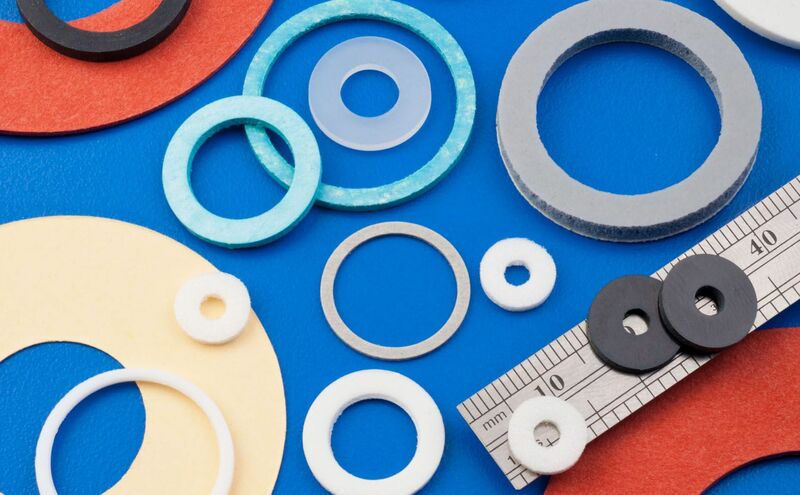 Washers are most commonly used for sealing, spacing, insulating, and vibration absorption. The washer being die cut for this customer is a straight forward component, yet the customer struggled with removing the pressure sensitive adhesive (PSA) liner during application. The customer approached ISP looking for some options for better liner removal. Washers often have an adhesive on one side with liner for application purposes. With many different liners and PSA specifications, ISP approached this challenge with two different solutions. The first solution was to apply a split liner PSA that would give the applicator the ability to peel off the liner through a slit in the middle of the washer. This option was trialed, and was not an ideal option for the customer as they were still struggling with removing the liner. ISP’s second option was to die cut the component with a small kiss-cut tab on the side of the washer. This option allows the applicator to pull on the tab that is connected to the liner, therefore allowing a swift and easy removal of the liner. With a simple design change, ISP improved the product and made it easier to use. The small kiss-cut tab became an easy solution for the customer to help solve their problem of liner removal.